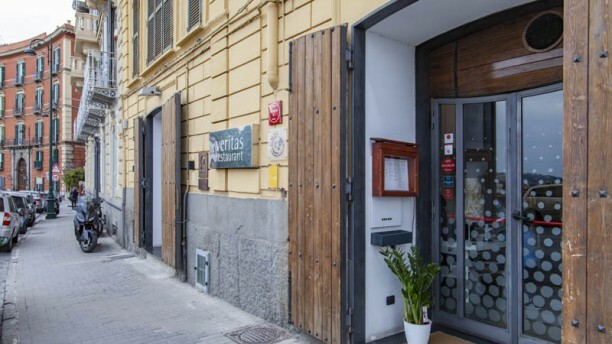 "TRADIZIONE E TERRITORIO - Il ristorante Veritas a Napoli è un locale gastronomico con una forte impronta territoriale. Gastronomico perché la cucina è il risultato della tecnica e della creatività dello chef; territoriale perché la Campania è il luogo e il mercato di provenienza delle materie prime. STIMOLI NUOVI - La cucina è aperto anche alle influenze contemporee: le suggestioni e le idee che vengono “da fuori” sono sempre una grande ricchezza. Altra caratteristica d’apertura è anche la predisposizione all'accoglienza e la grande qualità del servizio. VINI SELEZIONATI - La carta dei vini privilegia quelli imbottigliati direttamente dai produttori e che siano l'espressione di un territorio specifico. La scelta avviene solo dopo la degustazione e quindi vanno in carta solo quelli pienamente convincenti. " Absolutely great food, service and wine. For a good price. Outstanding food. Freindly and efficient service. Excellent value. A great night out. Would definitely go again on our next trip to Naples. Good cooking, amazing wine, delicious veal, a little disappointed by the service that was slow and not the warmest, good experience though. Fantastic food. The beautiful cuisine of Naples with an innovative touch that enhanced every dish. The "Home made “Cavatelli” with flying squid, white beans “Controne” and cheek lard" is a dish to die for. Can only recommend. Original, different dishes. Lots of "amuse-bouches" between courses. Formal-style service. Good value for a One Star Michelin restaurant. The arrival experience wasn’t that great and the service remained like this the entire evening, however the food was incredible dish after dish no disappointment . Plus the Chef send some small dishes in between. So overall good experience, but the services is defetnely not a star !! We had a very nice dining experience. The food was well prepared and presented. All staff were attentive and helpful, and the sommelier suggested a pretty good wine. We enjoyed especially the seafood, very tasty like the sea! Excellent service. Staff was perfect. The food was very good. Only a couple of dishes made me think this could deserve a Michelin star, otherwise, the rest was just tasty as it should. Not disappointed but no wahoo effect neither. I'd still recommend it if you want to eat something different than most restaurant in Naples. Wine pairing was great too, thanks to the sommelier. We were a family of 6 and this was our kids' (17, 19, 21 and 22) first Michelin star restaurant. My husband and I have been to several. Of course the service was impeccable. The food had mixed reviews. We all did the tasting menu. The tuna, the pasta with the raw beef and the veal got rave reviews. The octopus salad, spaghetti with clams and the sea bass were good but nothing to rave about. And when you pay these prices you should come out raving about it. So overall it was good but not a favorite. Si mangia pochissimo e male. The restaurant offers a creation of menues that star ranked michelin restaurants offers but the quality and preparation can not reach that high quality. The menue was just ok, the service was good but not very welcoming. I would not recommend for real gourmets. One small room on the left is lovely. The larger room is rather gloomy. Impressive wine list with an emphasis on local produce. Innovative take on the traditional Napolitan cuisine. Excellent restaurant! Absolutely delicious food with interesting extras.This is a very simply designed restaurant and not really very attractive.We have eaten here on three occasions and have always found the food and wine to be excellent.The service is rather slow and unfriendly.